Who is the Fox Cincinnati Development Team? 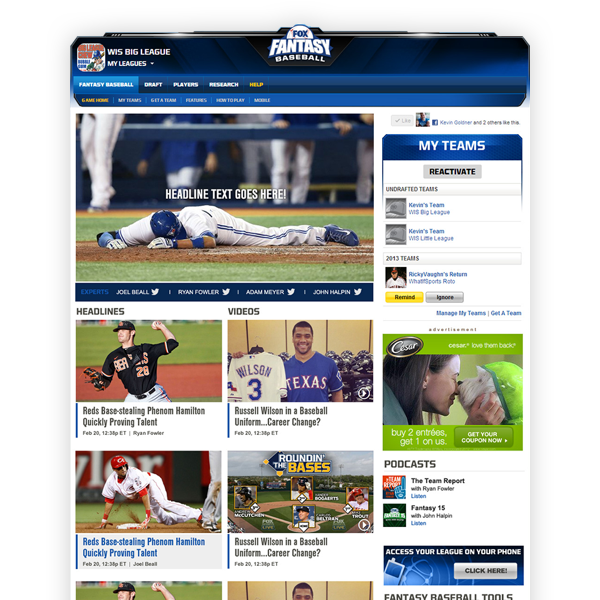 Over the years, we have created some truly exciting products for WhatIfSports.com, FOXSports.com, and, now, the FOX Digital Consumer Group. 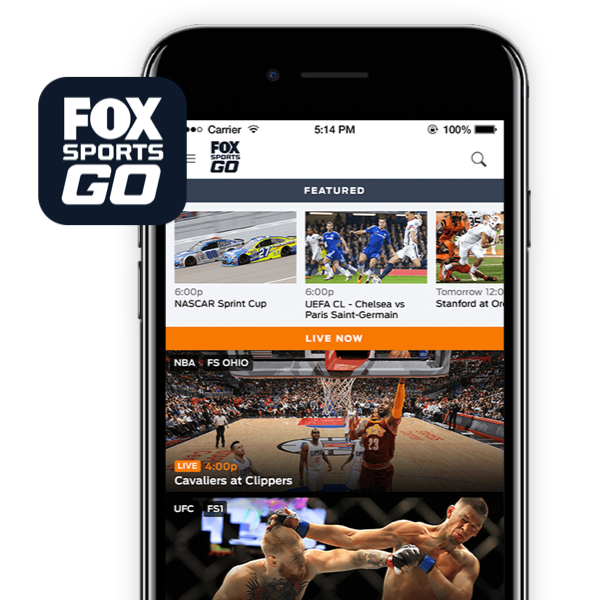 Our team became serious about mobile development when we took on the flagship FOX Sports app for Android. Our cross-platform approach proved dividends when the success of the four-star rated Android app led to our office building the iOS version shortly thereafter. The new 4.0 versions both launched in August, 2017. 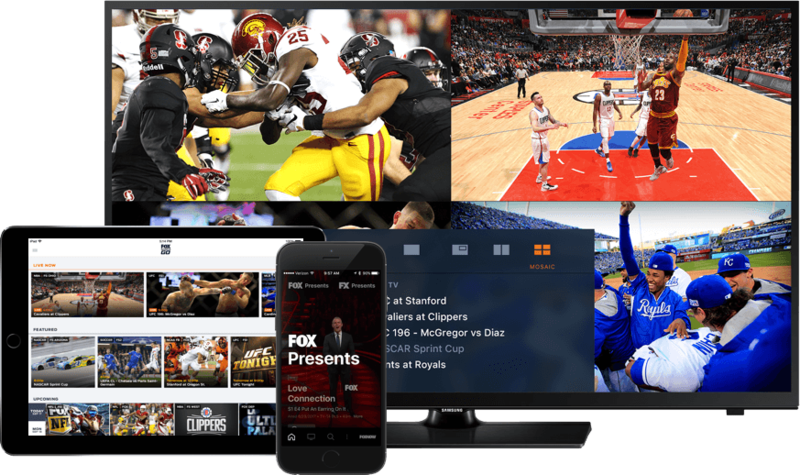 The FOX Sports app focuses on your favorite teams and sports, centralizing scores, news, schedules and more in a bold, easy to digest format. 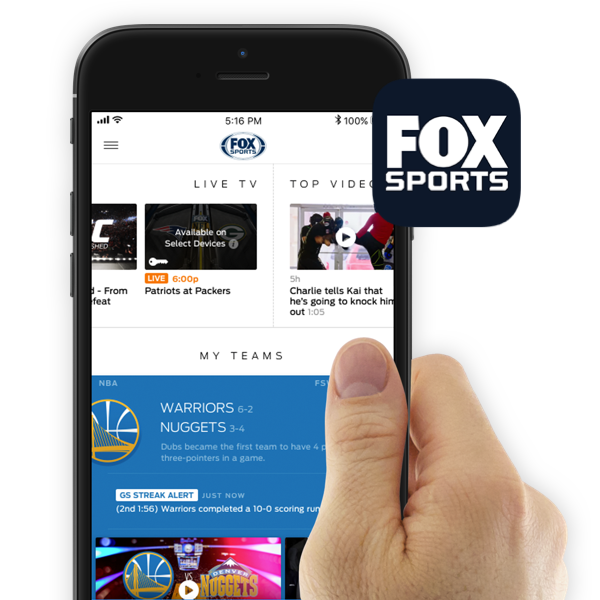 Visual alerts, vibrant scoreboards, fast updates, show clips, videos, live streaming hooks and more make it a must-have sports app focusing on the best of FOX Sports. Abbreviating seventeen years of passion, innovation and development in a few paragraphs is difficult, but it's easy to say WhatIfSports development is where our office took shape. The core website included SimMatchup which featured the original version of all our incredibly realistic and sophisticated game simulation engines. 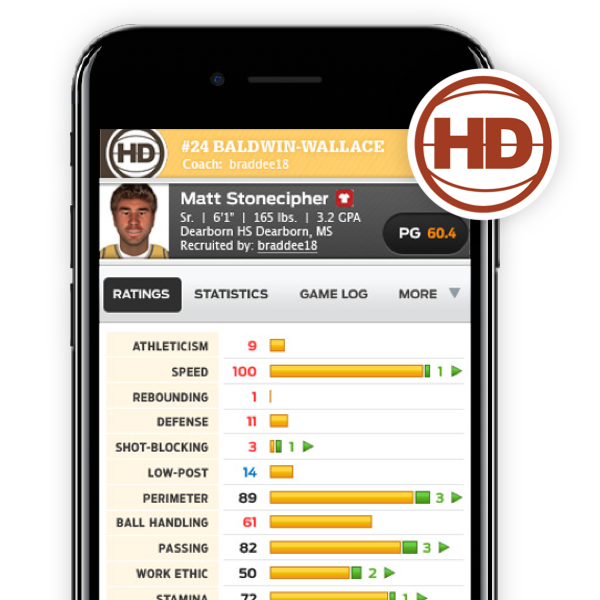 Pick any two teams from throughout history and instantly generate a detailed box score with play-by-play and statistics. Dream Teams built on this concept, as you could create a roster of players from throughout history and then play games. In addition to the SimLeague and Dynasty games, the core site included user forums, an outstanding customer support system, developer chats, an internal user communication tool and much more. 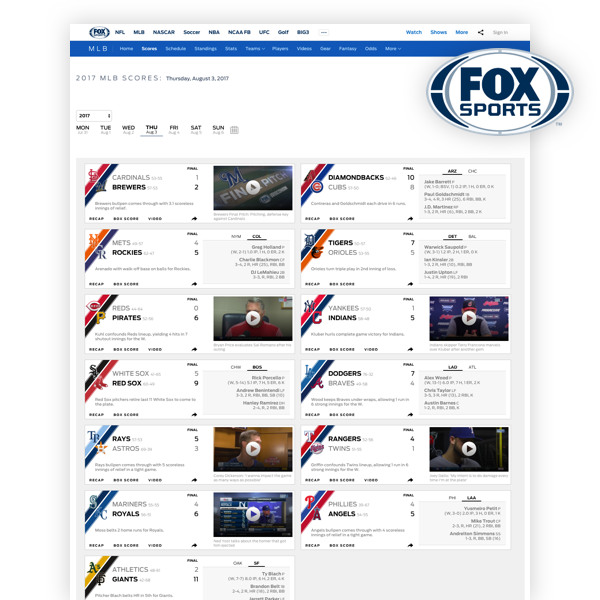 Our office has developed some key pieces of the FOX Sports website including every data-powered page, the score strip and account registration with personalization. Each page is powered by the internally developed FOX Sports Data system which covers over 15 sports including 50+ soccer competitions. FOX Sports GO allows customers to watch live sporting events on their phone, computer, tablet and many connected devices. Our office generates a feed utilizing dozens of sophisticated algorithms to power the display of the GO app. Using a mix of automated tasks and a support site for internal staff, we're able to present customers with the events they care about the most. 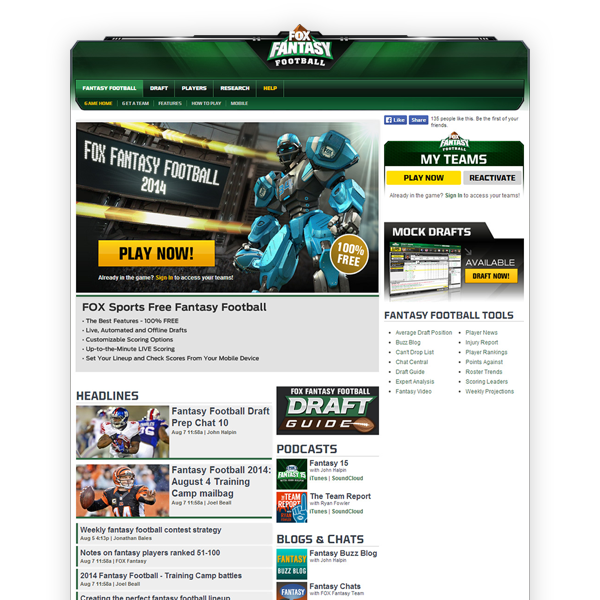 The FOX Fantasy Football Commissioner game was built from the ground up in 2011. The game was incredibly deep with hundreds of league options and was incredibly reliable over its 6-year run. The code base was large and the technical challenges were many but we took great satisfaction in seeing all the complicated parts working successfully week after week. 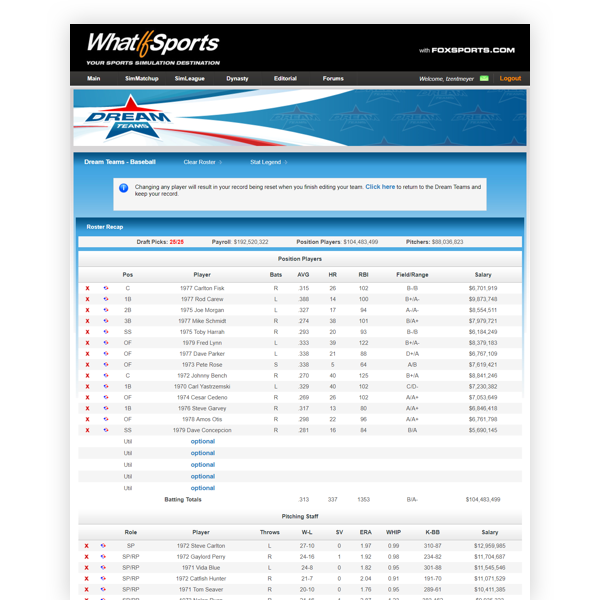 Live drafts, waiver processing, live scoring, weekly scoring, trades, custom league scoring, stat corrections, etc. Our first mobile app was for FOX Fantasy Football. Released in 2013, it was a must-have for all our iOS fantasy players. 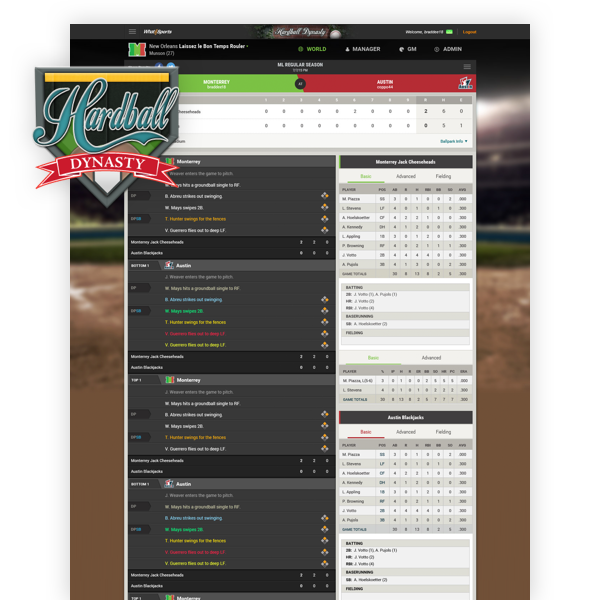 Hardball Dynasty is the ultimate baseball simulation game where every decision matters. If it's in the MLB, it's in HBD. While all franchises and players are fictitious in each 32-team world, it doesn't take long to begin following your franchise and players closer than your real-world favorites. While you manage all six levels of your franchise, success at the major league level is what matters most. March Madness was always the busiest time of year in the office and Bracket Challenge was a huge reason why. As soon as Selection Sunday announced the first team in the tourney, it was a mad dash to reach tipoff on Thursday. 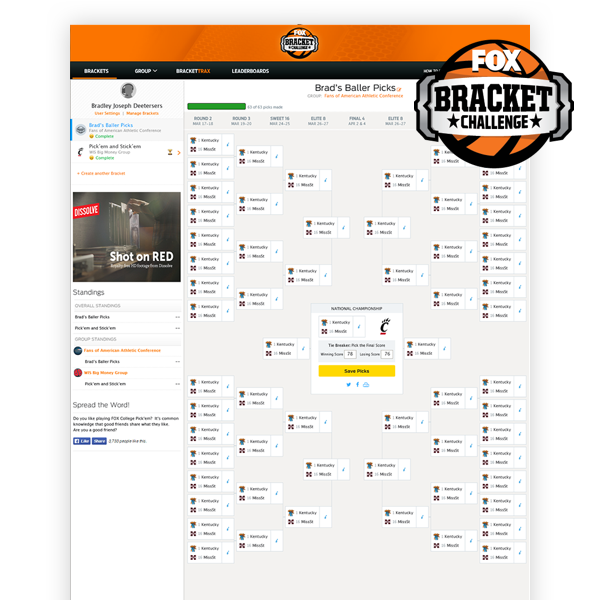 Groups and brackets were created and filled at rapid rates with predictions generated and simulations running. Once the college basketball tourney games started, the focus shifted to live scoring with group and contest leaderboards updating within seconds of each game going final. Technically, these situations provided many challenges that were fun to architect. Occasionally, watching everything work was as stressful as the final seconds of a buzzer beater. NASCAR has always been big on FOX and the FOX Fantasy Auto game put the focus on the drivers. Participants were challenged to build their own team of five drivers each week to compete for weekly, segment and season prizes. 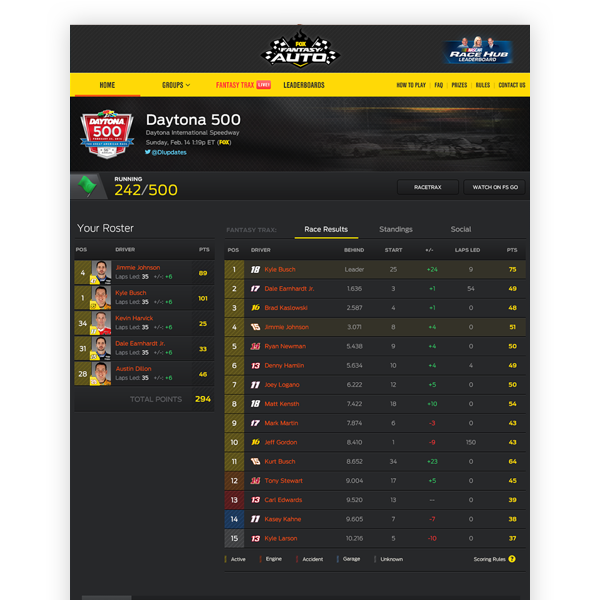 Groups and live scoring made the game a must for fantasy auto racing enthusiasts. Watching your group leaderboards update as your driver took first place made it a great second screen experience each week of the racing season. 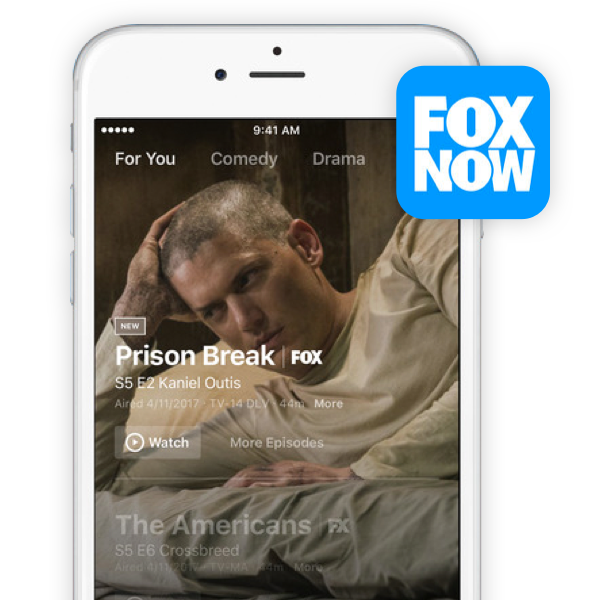 FOX Now puts some of the best FOX content on your devices for easy consumption at home or on the go. Watch live or on-demand, all within a visual compelling experience. The recommendations you see in the app? Our team powers the feature with a mixture of tools and technologies. Machine learning? You bet! Fantasy Baseball, like it's Fantasy Football sibling, was an intense Commissioner game. In fact, it was far more complex with its varied league options, scoring options and daily formats. Roto scoring, head-to-head, total points. Daily scoring or weekly scoring. Disabled Lists, position maximums. The options just kept coming, which is why the game was so great. We took great pride in the game's reliability and easy-to-play interface. 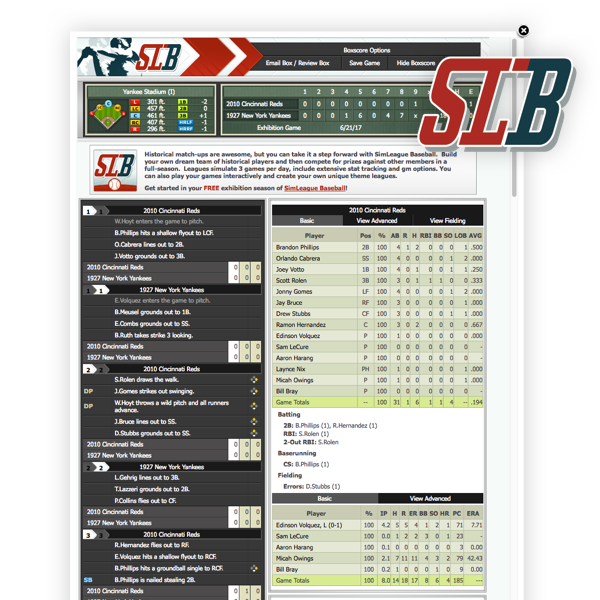 SimLeague Baseball was the first pay-to-play subscription game we developed. It built on the SimMatchup and Dream Team concepts. 24 owners could draft their own roster of players from throughout baseball history and then compete over a full season schedule, then the playoffs. The game combines managerial options with general manager options and a growing collection of league, team and player statistics and game results. The game eventually saw the introduction of the automated Theme League Wizard which made the enforcement of custom rules much easier. Theme leagues, after all, is what makes the game so great as there's no end to commissioners' imaginations. There is also a SimLeagues Live feature that allows two users to go head-to-head and make decisions while the game is in progress. We eventually reached the conclusion our game engines could be used to do more than power our games - they could also predict the future (with a few tweaks, of course). It didn't take long for us to begin generating and publishing predictions for the big 6 US sports. 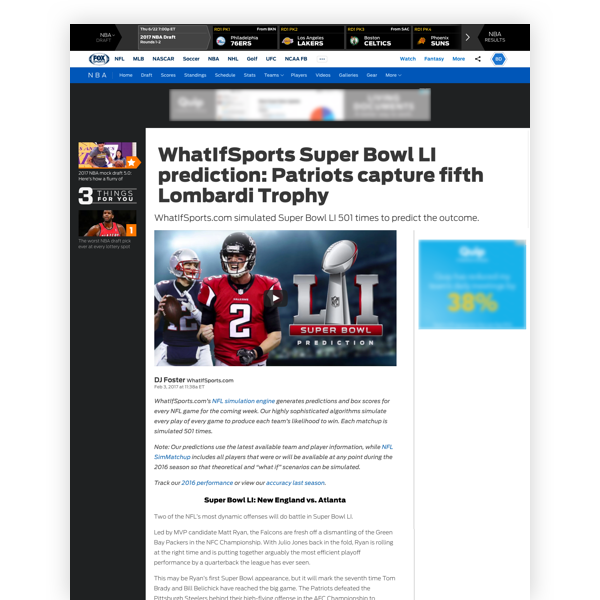 Our playoff predictions were routinely published and cited in some top newspapers, websites and FOX Sports broadcasts. We were even on ESPN several times. What If the 1994 MLB season wasn't cut short, for example. Now, you can find our predictions for every NFL and college football game on the FOX Sports website. Hoops Dynasty was our first Dynasty game and it's just as great 10+ years later. Start as coach at a small D-III school and work your way to your D-I alma mater. But it's not easy, because you're competing against hundreds of other serious college basketball fans. The game was incredibly fun to develop because of its diverse features: recruiting, scouting, game simulations, scheduling, player development, practice plans, etc. The FOX Sports Data system powering the website and apps successfully completed its original daunting mission when it became the backbone of the scrolling ticker at the bottom of all FOX Sports national and regional broadcasts. The office is always proud to share this responsibility while with family and friends taking in a local Reds game or national NFL game. At FOX Cincinnati, we have a unique history of developing innovative products. While our focus changes from time to time, our passion for building great solutions does not. Our focus now is on sports and entertainment -- And we want you to join the team! Find our job openings below to start your career in the sports, entertainment and software development industry. If Our Work and Company Culture wasn't enough, working for FOX also includes some great benefits. Are you an innovative sports fan interested in shaping the future of FOX Sports Digital? Do you enjoy the power of data? Help us fuel the systems that power FOX Sports. Sports fan? Into technology? Creative? Help us build the future of FOX Sports Digital. Do you enjoy developing exciting, interactive experiences using the latest tech and tools? © 1999-2019 FOXCincy.com. WhatIfSports is a trademark of WhatIfSports.com, Inc. SimLeague, SimMatchup and iSimNow are trademarks or registered trademarks of Electronic Arts, Inc. Used under license. The names of actual companies and products mentioned herein may be the trademarks of their respective owners.